Many people have responded to my recent mailings and told me of Rodeos around the world – USA, Germany, Chile, Russia, UK, India…write to me please and tell me what is happening in your country. Apart from being exciting, Forklift Rodeos can return a lot of benefits to your company – and I am sure that they can add to your bottom line if you run warehouses or factories. I imagine there is also a return for forklift manufacturers or dealerships who sponsor them. Forklift competitions are not only about improving skills and safety awareness they are about team building and company and product promotion, building liaisons with other companies and adding a richness and international outlook to your company culture opening untold doors and prosperity. Many years ago I was managing about 800 employees in a warehouse environment. My biggest challenges were ongoing training and maintaining morale and the results were not as good as they should be. In all organisations, whether they be private enterprise or public service, people get bored and see their daily work as repetitive, meaningless, unimaginative, wasteful etc. I would like to think it was a stroke of genius, but in fact it was just something that fell in front of me, I entered my company in a Forklift Rodeo. We had our trials and entered three teams. Lo and behold a member of one of our teams won the individual regional trophy and went on to become the Australian Champion Forklift Operator. Wow! How great that was for him. Wow how great that was for every person in the company. Overnight staff started to describe themselves differently. They were now working in this fantastic company where safety and attention to detail was inherent in their daily routine and tasks; where training standards were extremely high; where output was paramount and where the Australian Champion Forklift Operator was a Mate from their warehouse. We all need to be reminded of the need to improve our skills, for attention to detail in our jobs and that safety is paramount. I could tell them about the valuable contribution of our work…..but it is not the same as recognition from external sources. In a similar way you might consider Forkliftaction as an “external source”. It seems to me that if your staff get a weekly dose of Forkliftaction it can help them see their place in the industry as an important contribution to their nation; they can see their company’s place in creating exports and earnings, defence or agriculture. They will be reminded of the need for industrial safety. They can see new innovation being implemented. These reminders inspire us to renew our work energy and be creative in our work. So, back to Forklift Rodeos… the sooner you get your company involved the better. Give me a “hoy” and we will help you promote your event or your involvement. This photo taken at the USA Open Forklift Rodeo 2009 in Clark County, Ohio. 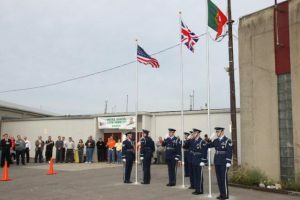 Organised by Richard Higgins (RIP), they hosted teams from USA, Portugal and the UK. Sponsored by Yale, the event attracted a lot of commercial interest and involvement of the US Airforce who provided the ceremonial support. There are many events coming up. In Germany, the first regional StaplerCup was on April 23, the last of altogether 25 heats will be held on July 2nd. on the related communication launch soon. In Chile and Russia…. ForkliftCups have already started their national qualifying heats. The German finals as well as the International Championship“ including all participating nations will be held between September 15 – 17 in Aschaffenburg. Every nation will send the three winners of their countrywide competions; also some nations will nominate a team, so that in the end we can expect about 20 teams for our International Championship. …In the USA, he Washington State Governor’s Forklift Rodeo. The first event scheduled for June 4th in Spokane Washington. This will be the 19th year that the Washington State Safety & Health Advisory Board’s Material Handling Planning Committee, led by Al Rainsberger and Tim Eacrett, has presented the Rodeo. 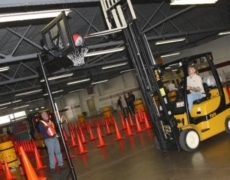 We believe that this was the first forklift related safety competition in the world, and to date remains the gold standard for events of this kind in the United States. In fact, competitors come from as far away as British Columbia, Canada and Hawaii. Sponsors at these events include the Boeing Co., Ste. Michelle Wine Estates, Pape` Material Handling, Stellar Safety Supply, Foss Maritime, Northwest Forklift and will be officiated by Overton Safety Training. …In the USA The first annual Blue Mountain Forklift Round Up in the great State of Oregon. The Forklift Roundup is being presented by the Blue Mountain Occupational Safety & Health Conference Board, in partnership with Oregon OSHA and The Oregon SHARP Alliance. Sponsors of the event include some of the region’s major employers, like Tillamook dairy products, Boise Cascade wood products, McCormack Construction, Eastern Oregon Rentals, Wildhorse Casino, ConAgra/Lamb Westin, and also a sponsor, the event will be officiated by Rob Vetter and his staff from Ive’s Training Group. The Forklift Round Up will be held on June 6th, as the kickoff event for the Blue Mountain Occupational Safety & Health Conference. …In the UK RTITB announced that the ‘International Forklift Operator of the Year 2016’ contest opened entries on 4th April. Taking place every three years. The 2016 competition promises to be bigger and better than ever before; this year any forklift driver* may enter, not only those with RTITB certification. Also for the first time it will be an international event – employers from all over the world are invited to enter their drivers and the winner of the recent Forklift Operator of the Year From India , Srinvasa N D, has also been invited to compete in the 2016 heats. Opening on 4th April, the first stage in the competition is a series of online hazard perception tests. Following these tests, the 40 entrants with the top scores will be invited to participate in the next round of heats. From 13th – 16th September at IMHX (International Materials Handling Exhibition), the selected drivers will be required to complete one theory test, one pre-use test and two practical driving tests. The 10 best operators from these heats will then have the opportunity to take part in the grand final of the competition in Telford on 11th November, forming part of RTITB’s November conference for forklift managers and decision makers. In the final, operators will compete in various live challenges in front of an audience in a bid to be crowned ‘International Forklift Operator of the Year 2016’. The winner will be announced at a glamourous Awards Dinner later that evening at the Telford Hotel & Golf Resort. To request an entry pack, simply contact Amy Southall at RTITB – fltcompetition@rtitb.co.uk – (0)1952 520218.